Your clients want to book a package but it says "Sold Out" even though you know there are available spots left. Why is this happening? a) You have reached the total maximum number of participants per trip. After that, your whole trip will automatically be sold out. To make the trip bookable again, just go and edit your trip in the trip basics section and increase the maximum number of participants. Example: You have 10 people participating already. The new number of participants needs to be at least 11 for the trip to be bookable again. b) You have reached the total maximum number of bookings per package. After that, the pricing package will automatically be sold out. To make the package bookable again, just go and edit your trip in the pricing section and increase the availability of the package. Example: You have 5 people signed up for the package already. 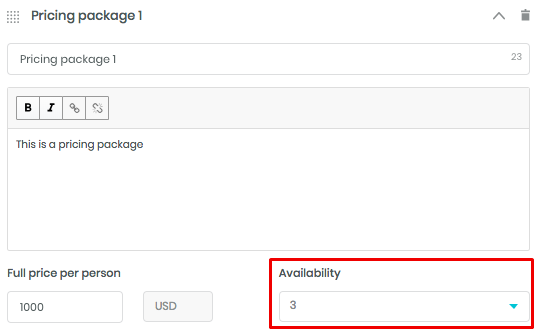 The new availability needs to be at least 6 for the package to be bookable again.